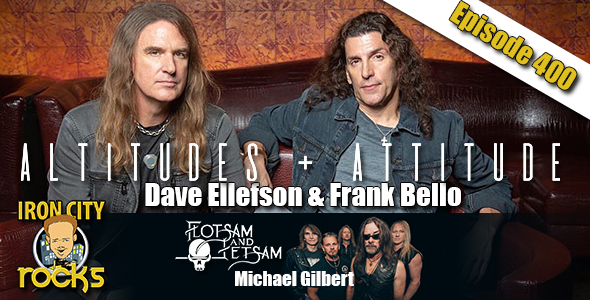 In our special 10th Anniversary, 400th Episode of the Iron City Rocks Podcast we welcome David Ellefson of Megadeth and Frank Bello of Anthrax who together form Altitudes and Attitude. A&A are set to release Get it Out, their first full-length release. Frank talks about what it’s like to be the lead singer and guitarist, writing songs and working with an amazing array of guest guitarists. David talks with us about his 8 & 10-string bass work, playing bass in a band with another bassist, the logistics of the project and the importance of producer Jay Ruston. We are also joined by Rock and Roll Hall of Famer Denny Laine to talk about his time with the Moody Blues and Wings as well as his current string of US tour dates with his Moody Wing Band. Finally Michael Gilbert of Flotsam & Jetsam join us to talk about their amazing new album The End of Chaos.